See our Link G4+ ECU Price Promise! The Link G4+ range of engine management systems are already well known for delivering class-leading performance without sacrificing factory levels of drivability. The G4+ plug-in ECUs are designed to be the most complete plug-in solution yet. This SR20 plug-in ECU will save you time and money as it will plug straight into the vehicle’s original wiring loom without the need for messy adaptor harnesses. 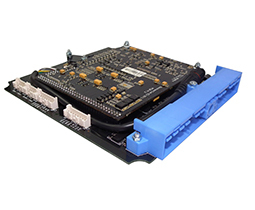 It replaces the original circuit board inside the factory ECU enclosure and mounts using the factory brackets. It is suitable for many different SR20 engines that use a 64-pin blue plug ECU and a manual transmission as detailed below. Automatics are not supported. This plug in has also been successfully used on some other SR20DE and SR20DET engines that use a 64-pin blue plug ECU. 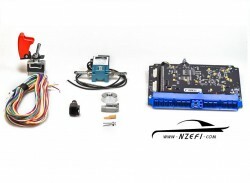 It will NOT work on any models that use a larger 76 pin blue plug ECU (S13 CA18DET and S14 pre-facelift). We have another G4+ plug-in ECU for this model. Once the installation is complete, the Link G4+ allows a good tuner to achieve an optimal state of tune to get the most out of any combination of modifications. All Link G4+ plug-in ECUs come with a base map. While these maps are designed to help save time for you and your tuner, it is essential that these are used simply as a starting point for further tuning. The engine can easily be converted to speed density by removing the air flow meter and instead using a suitable MAP and air temperature sensor. Likewise, this ECU can also be setup to control boost electronically with in-cabin adjustment. This eliminates the need to purchase a separate electronic boost control system. MAP sensor – This ECU comes with an on-board 4.0Bar (up to 44psi boost) MAP sensor. If higher boost pressures are required then an external MAP sensor may be used and connected to one of the analog inputs of the G4+’s expansion connector using the XS Loom (sold separately). 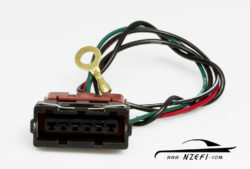 Alternative options exist for modifying the factory loom to use existing wiring for an external 12V MAP sensor (contact NZEFI for details on this). The airflow meter is not required. Inlet Air Temp sensor (IAT) – An appropriate IAT sensor (sold separately) should be fitted just prior to the throttle body. 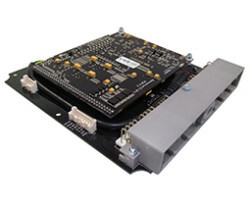 These can be connected to the expansion connector of the ECU using the XS Loom (sold separately). Alternatively options exist for modifying the factory loom to use existing wires for the IAT sensor (contact NZEFI for details on this). Boost control – The factory boost solenoid wiring on SR20DET S14a and S15 may used, however an appropriate boost solenoid (sold separately) must be used. This solenoid may be fitted to other models where electronic boost control wasn’t originally used by making a minor modification to the wiring loom (contact NZEFI for details). 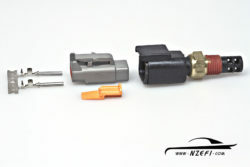 Injectors – The Link G4+ plug in is NOT designed to be used with low impedance injectors. All Silvia models are factory fitted with high impedance injectors so no change is required. However if aftermarket low impedance injectors have been fitted then the correct ballast resistors MUST be fitted. These are available separately. GTI-R engines have low impedance injectors from factory, but they already have ballast resistors. If the GTI-R injectors are replaced with high impedance injectors then the factory ballast resistor pack must be removed. These may be used for functions such as driver adjustable boost control, switchable fuel/ignition maps, wideband lambda input, external MAP sensor, fuel pressure and oil temp/pressure. Any redundant outputs may be reconfigured & used for alternative uses, eg extra electric fans, intercooler water spray, shift light, water injection (we NZEFI are happy to assist in details of setting these up).